Choosing a Sight Reduction Method - Celestaire, Inc.
“Sight reduction”, is a term given to the way a sextant sight is transformed into a line of position on a chart. It is what the so called “math” concerning celestial navigation is all about. The simplest method of sight reduction is to draw a circle of equal altitude of a celestial body on an Earth globe. The essence of sight reduction is to draw a segment of this circle on a smaller area chart. Choosing a method is a little confusing because there are three main categories available: standard tables, compact tables, and computer generation; and within each of these, there are further choices. For the beginner, we recommend using one of the standard tables; either Pubs 229 or 249. If one is taking a course, he or she should use the tables directed by the teacher. Although many of the text books are oriented toward either 229 or 249, these tables are very similar, and it is not very important which tables are used with a particular book. A discussion of each of these tables follows with their listings. The Concise, or S-table sight reduction tables are examples of compact sight reduction tables, and should be reserved for the intermediate or advanced navigator, or as an emergency or lifeboat method; or as a back-up method in event of computer failure. Such tables are more complicated to use, and invariably take more time to use. 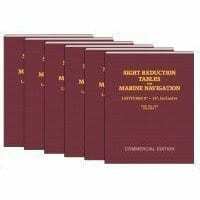 A copy of concise sight reduction tables is included as an appendix in the Nautical Almanac. A scientific calculator may also be used to directly solve the equation for sight reduction, and is a fullfilling exercise. The Nautical Almanac should be part of every navigator’s equipment. It is required for both the standard and compact tables, and has a wealth of information not resident in navigational computers. As a single book, it provides a complete manual back-up for all celestial navigation needs. The Nautical Almanac is published in both government and commercial editions. They are digitally identical in tabulated content. Since the commercial edition is much less expensive, it is the one we recommend, and is the only one we carry. 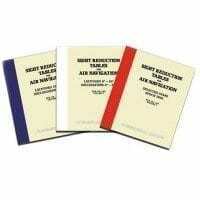 There is another almanac called the Air Almanac which we also do not carry due to its high cost. It is designed with tabulations every ten minutes instead of each hour. This almost triples its size and cost. Despite occasional rumors to the contrary, the Air Almanac is not required in order to use Pub 249 (air navigation) sight reduction tables. A navigation computer or computer program may be used by anyone at any stage of expertise. See discussion of COMPUTERS AND NAVIGATION. We recommend that beginners learn the traditional way using the Nautical Almanac and tables first before using computer methods.